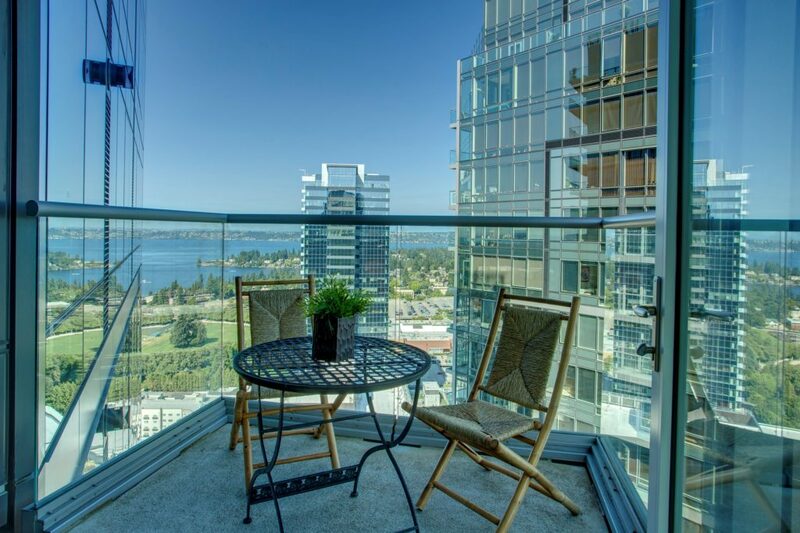 Developed in a premier location of downtown Bellevue, this luxurious end-unit features a wall of windows and a private northwest facing balcony with enviable views of the Olympic Mountains, downtown Bellevue, Lake Washington, and Seattle. Rich in natural light with extensive upgrades and quality finishes throughout. Includes an art gallery foyer and a spacious living room and dining room featuring white oak flooring and nine foot ceilings throughout. Chef’s kitchen includes granite counter tops and back splash, cherry wood cabinets, Wolf Sub-Zero 6-burner cook top, Sub Zero refrigerator, Bosch dishwasher, Wolf oven and microwave, walk-in pantry, and center island with ample storage. The unit has an opulent master suite with views of the city, California closet, and spacious master bath with a double sink marble vanity, tile flooring, and custom walk-in tile shower. The second bedroom has a suite bath, walk-in closet, and views of the city as well. There’s a flex room with additional lighting and closet space for storage. The home comes with two parking spaces as well as a storage unit. Bellevue Towers is within seconds to shopping, restaurants, and all that downtown Bellevue has to offer. Amenities within the building include spa, gym, concierge, theater, an urban garden, and more! For more details / photos / open house schedule, please visit www.UrbanBellevueLiving3606.com. Interested in knowing the value of your home? We would be more than happy to meet with you to give you an estimate. You can also search for all active homes (residential OR condo by building) on our website at www.UrbanBellevueLiving.com. Contact us today!